Whether your 10mm Auto self defense pistol of choice is a Glock 20, Colt Delta Elite, S&W 1006, or even a Bren Ten, this Hornady load will serve you well. 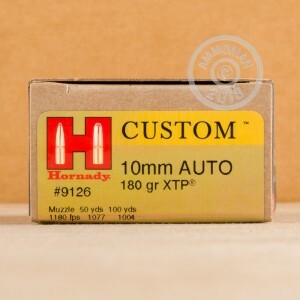 It uses Hornady's proven XTP jackted hollow point bullet to augment the 10mm's strong penetration with effective expansion. The light 180 grain bullet moves fast and hits hard to ruin an assailant's day in a hurry. Hornady is one of America's most renowned bullet manufactreres and its loaded ammo is engineered to take full advantage of its innovative designs. 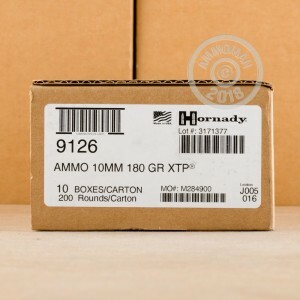 These rounds come packaged in boxes of 20 and use non-corrosive Boxer primers and reloadable brass cases. 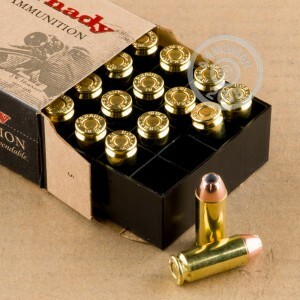 Purchase $99 or more worth of ammo from AmmoMan.com and get free shipping direct to your door!